As promised, here is our recipe for Bruce’s every-day biscuits. Preheat your oven to 160ᵒC/Gas mark 3. To start, mix the flour, oats, lard and cheese in a bowl. Then add the stock until it all comes together into a ball of dough.You may not need all the stock, so don’t quite add it all at once as you don’t want to end up with a sticky gloop of flour all over your hands (trust me, I’ve been there 😀 ). 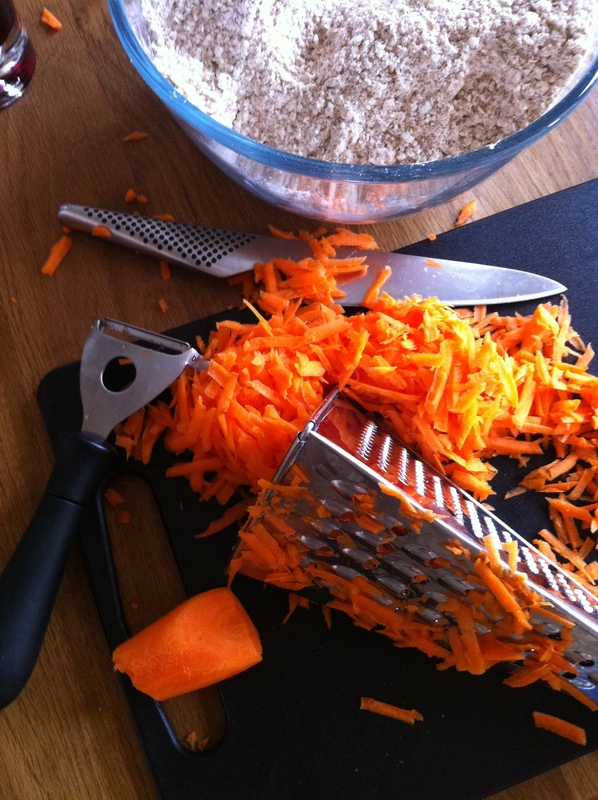 Finely grate the carrots and work that into the dough ball. Next, tear off a piece of greaseproof paper the same size as the baking sheet you’re going to use and lightly flour it. Roll out the dough to about ½ a centimetre thick and then cut it into biscuits. I find that using a pizza wheel is the quickest way at carving the biscuit shapes. I like to keep some a bit bigger for more of a treat and also make tiny little ones to talk out on walkies. Bake the biscuits towards the bottom of the oven for 40-50 minutes. When they are looking golden in colour, turn the oven off but leave them in the oven to dry out fully for that all important satisfying crunch. These biscuits are not too shabby for human consumption either, so if you get a bit peckish out on your dog walk they’ve got you covered too. If there’s one thing guaranteed to get Bruce salivating, it’s a homemade beef bite. There’s a world of processed dog treats out there but, like many off-the-shelf treats for humans, it’s not always clear what’s in them. These beef bites are 100% lean beef, so you can dish them out with confidence. To make Bruce’s beef bites, buy some lean beef. Chop the meat into cubes, around 1cm big. Whack some baking parchment on a baking sheet and scatter the cubes of meat on it, fairly close together. Put the tray into a cold oven and heat it to 150°C. Cook the meat for one hour. After an hour, reduce the temperature to 100°C and prop open the oven door to let the moisture out. Leave the meat in the oven at 100°C with the door propped open for a further two hours to dry the meat. Once out of the oven, let the beef bites dry overnight at room temperature and pop them into an airtight container the next day. They’ll keep for up to year in there. Beef bites, done. The guy adores his ball. Nothing else – and no one else – exists if he’s running after his ball. It’s funny, he never used to be into playing with a ball, until he realised he could beat his best friend Buddy at the chase and win every time. Since then, he’s been mad for it. He literally runs as fast as he can and, if another dog comes to play, they don’t stand much chance of winning the race. 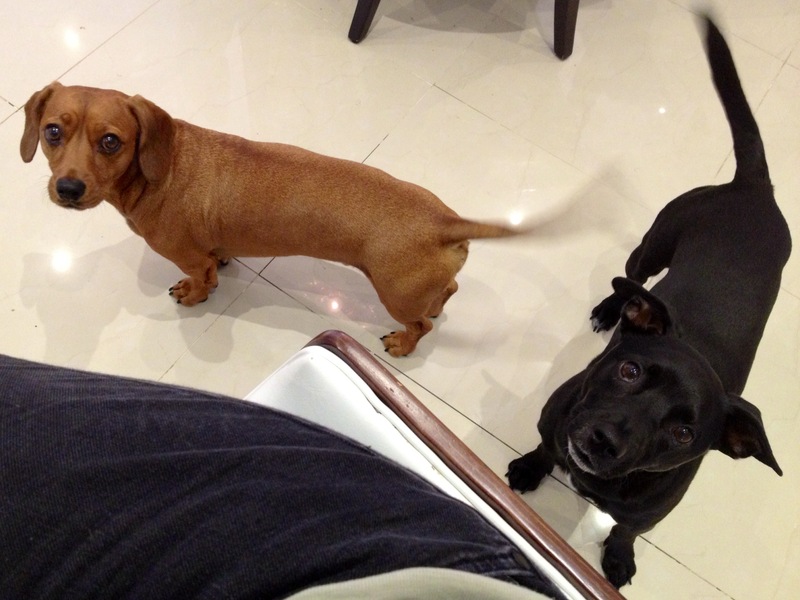 Buddy and Monkey – two miniature dachshunds belonging to our best friends – are Bruce’s best friends, which is handy. Buddy is the eldest, and he did a dreadful job of disciplining Bruce when Bruce arrived as a puppy. 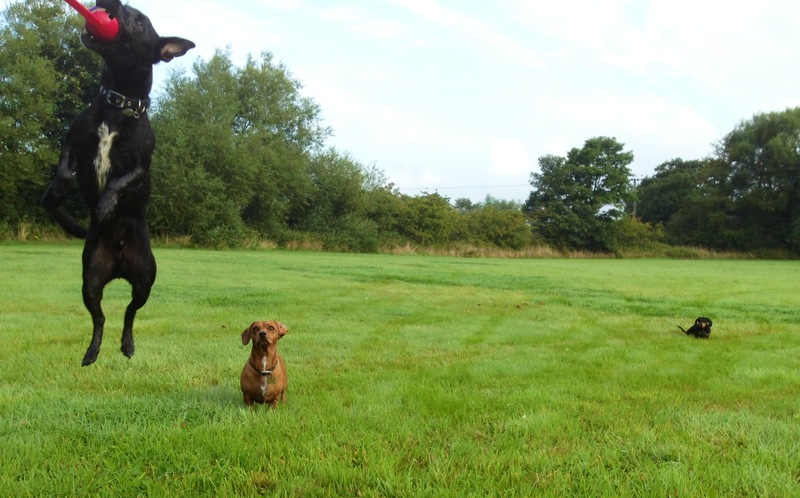 Bruce used to terrorise poor Bud, and it was a dark day for the dachshund when he discovered Bruce was now big enough to jump onto the sofa and there was no longer any sanctuary to be found. It’s not pleasant having a puppy swinging from your cheeks night and day. Monkey is the youngest – he may be the smallest but he’s definitely the loudest. There’s no point even throwing it – you know I’m going to win! The word ‘biscuits’ is banned in our house (as is the word ‘bone’), unless we want to send Bruce into a frenzy of excitement at the mere mention of the word. Biscuits are also known as ‘bribery’ at Mighty Pooch HQ – we use them to ensure Bruce is pleasant on the lead as he passes other dogs. He has learned to expect a biscuit if he doesn’t grizzle at other dogs while he’s on the lead. While Bruce is lovely off the lead and will play with other dogs happily, he’s not perfect on it at all times. 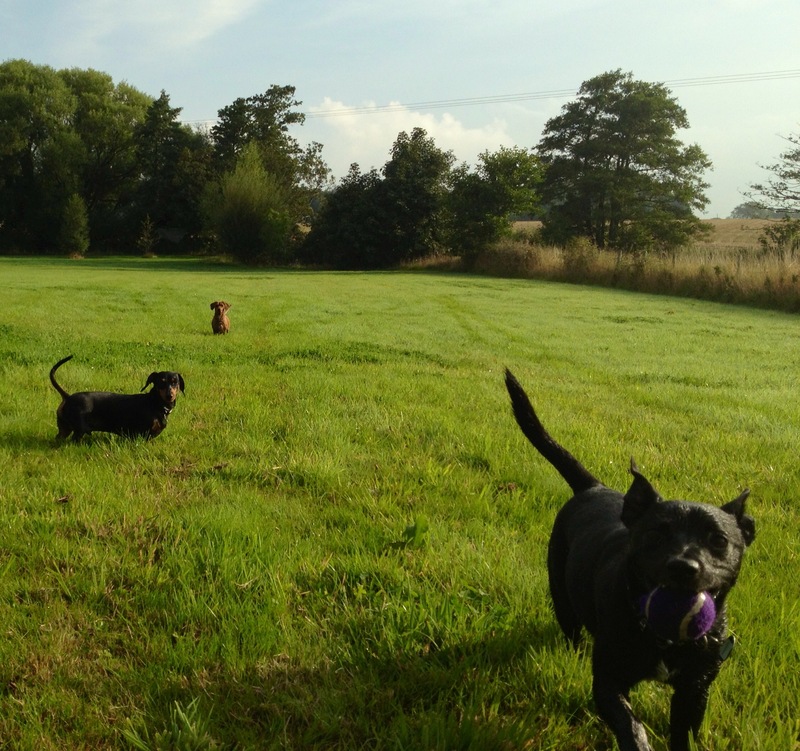 We think it stems from the time a dog who was off the lead leaped on him unpleasantly while Bruce was on the lead. Nonetheless, with the aid of our trusty biscuits, Bruce gets better every week. 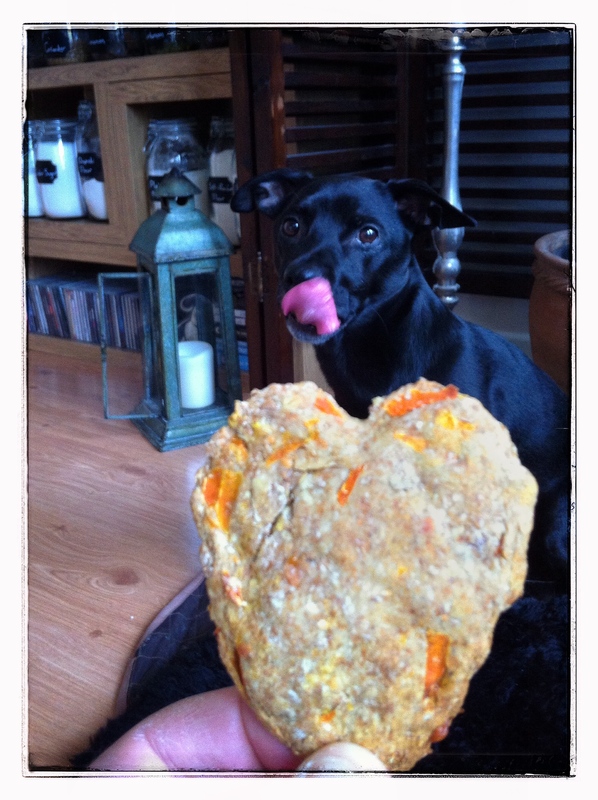 We’ll share a delicious homemade biscuit recipe next week (even Michael loves to snack on them!). Bruce is a dreadful boss pot. He demands star treatment every day. For example, he won’t arrange a blanket around himself on the sofa; instead, he has a little paw action he does to order the nearest human to do it for him. He (like many other dogs I’m sure) will also demand his tea at five o’clock sharp with a hard stare. He also orders extra walks with a hard stare and an exasperated huff. We once asked a dog behaviourist what that huff means and she confirmed it – he’s basically saying “Come on now, get a move on!” We hear the huff a lot if we’re all ready to go out and someone has lost a glove, which delays departure. Personally, I think it’s rude to swear, but try telling that to Bruce! Next time in Bruce’s world, we check out the Cs. Head back to A is for … here. Leaping over stiles, scrambling up banks, jumping onto walls and diving for his ball … being a fell terrier, Bruce is super agile. He runs so fast that he’s been known to somersault in flight as he accelerates to catch a ball before it comes to a stop. If the England football team had half the ball-eye co-ordination and speed of a little terrier, we wouldn’t have to hark back, misty-eyed, to 1966 all the time. I mean, come on, some of us weren’t even born then! That’s me. Michael and I took the unconventional pet parent step of not referring to ourselves as Mummy and Daddy. This has caused some confusion at times – at the vet’s, for instance, when ‘Mummy’ is referred to and Bruce looks around blankly, wondering who the devil Mummy is and why she’s going to hold his head while he has his ears examined! From me, he gets lots of cuddles – but I’m not the best one at throwing his ball, although he still seems to drop it at my feet no matter who is wielding the ball flinger. Here’s Bruce at around 6-8 weeks old. 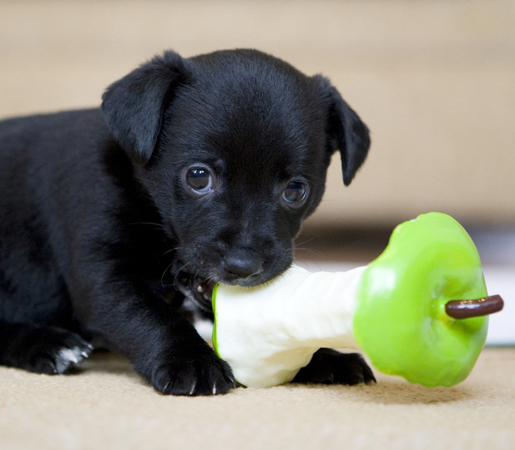 This was his first toy and, although it’s a fraction larger than a real apple, it’s a good indicator of how tiny he was. Like daft pet parents, we’ve kept this toy in a cupboard as a memento of his puppy days. These days, Bruce is at knee-cap level, so his view of the world involves plenty of table legs (lovely, as he likes to doze under the table in the day time), big feet (great, as where there are feet, there is the opportunity for a walk) and lamp-post bottoms (the local newspaper – a veritable noticeboard of who’s just moved to the area and all manner of other fascinating information extracted with one good sniff). If it’s in stock at the local perfumery (ie whichever field we happen to be playing in at the time), Bruce will often opt for a liberal spritz of eau de fox poop. Ah yes, the bottom notes of rotting vegetables, the mid notes of nose-wrinkling musk and those delightful top notes of bin-scavenging, putrid, indescribable poop. We once had to transport an extremely stinky Bruce in the car for over an hour – I had to sit with him wrapped firmly in a towel on my knee and we drove with all the windows open the whole way. If we see that shoulder start to dip during an avid sniff, we call him away quick sharp! 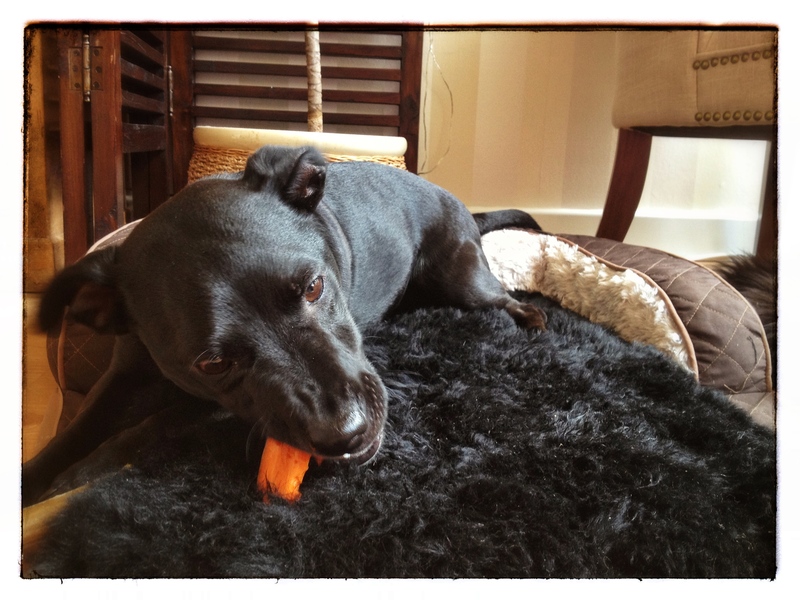 We have two furry rugs in our kitchen – and Bruce has clearance to sit on one of them, which we call the authorised rug. It’s the perfect size for him. It’s soft and furry and he loves to chew a rawhide or play with one of his teds while reclining on there. He is not, however, allowed to sit on the unauthorised rug, a lovely, thick, shaggy rug in our reading area. Now, Bruce absolutely understands this, including the actual term ‘go to your authorised rug’. So, when we went out the other day and left a camera filming him to see what he gets up to when we’re out, it made funny viewing. As soon as he heard the door close and our footsteps recede, he came out of his bed and went straight onto the unauthorised rug to luxuriate. We’ve come to the conclusion this could be a good thing – having somewhere he’s not allowed to go perhaps makes the prospect of us going out quite attractive. What’s going through his mind? “Hoo-blooming-ray! Unauthorised rug, indeed! I’ve been sitting on this rug for the last 18 months on and off and they never even knew!” While the cat’s away and all that …! Next time in Bruce’s world, we take a stroll around the Bs. 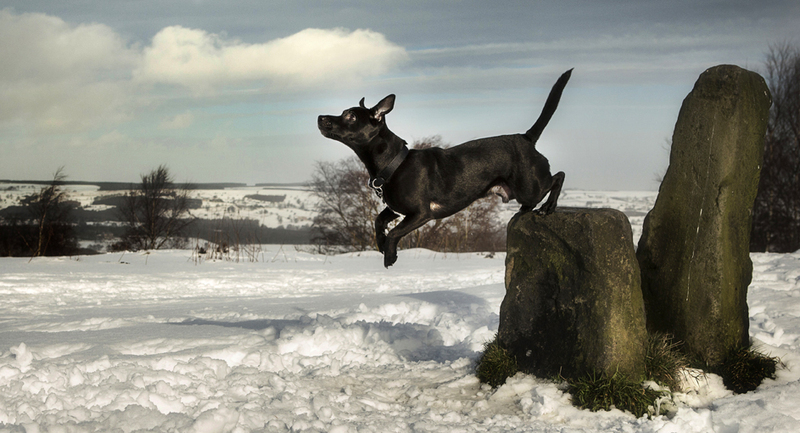 The Mighty Pooch are specialist dog photographers based in Yorkshire but happy to travel for photoshoots. Go behind the scenes of some of our shoots. Oh no, not the dreaded vets! 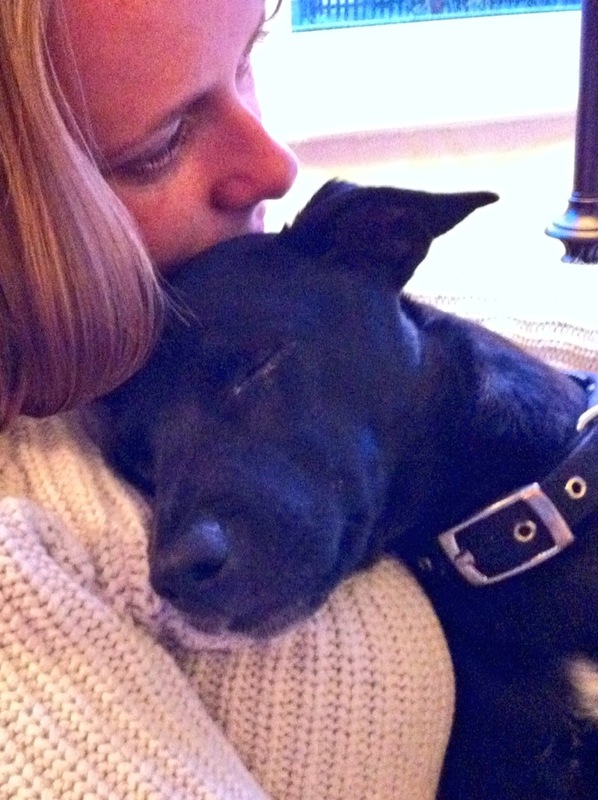 Your dog is your secret keeper, hot water bottle, personal trainer, welcome committee and biggest fan. Celebrate this with exclusive fine art photography from specialist UK dog photographers, The Mighty Pooch.